US, 1958, 80 minutes, Black and white. Mickey Rooney, Fay Holden, Cecilia Parker, Sara Haden. 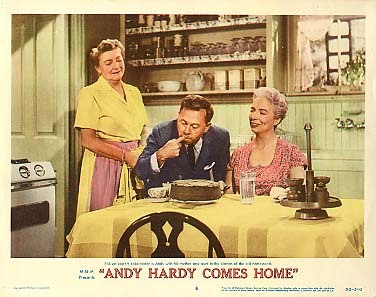 Andy Hardy Comes Home was the last of the Hardy Family films. It was made eleven years after the end of this series, Love Laughs at Andy Hardy, in 1946. It was an attempt to revive the series and the film has 'To be continued' at the end. However, it was not continued. Mickey Rooney at 35 does not seem all that much different from Mickey Rooney as a teenager and in his 20s. He has wife (Patricia Breslin) and two children (one of whom is his own son, Teddy Rooney). Fay Holden and Sara Haden (much older) return as mother and Aunt Millie. Cecilia Parker, considerably older, appears as Marian. The film has the spirit of the earlier films. Andy Hardy wants to be at the service of Carvell, his home town, bringing the possibility of an aircraft factory. People in the town begin to resent him and he goes through a crisis. However, after an impassioned appeal at a town meeting, the townspeople's attitudes change and he is welcomed - and indeed, offered the job of judge and the film ends with him sitting as his father did, on the bench. Lewis Stone had died before the series recommenced but it present him a portrait on the well and in the way that Andrew Hardy talks a man-to-man talk with his young son. The old American family values are still there - while updated to the beginning of the rock and roll era. It shows that times don't change so much . . .
A particular bonus is the flashback interludes with memories of Judy Garland, Lana Turner, Esther Williams in her first swimming scene. The film is an echo of a bygone era.